Admiral William H. McRaven, commander of the United States Special Operations Command, was selected by the governing board of The University of Texas System as the sole finalist for chancellor. At a special meeting held on Tuesday, July 29th, the UT System Board of Regents unanimously approved McRaven’s recommendation. He had met earlier this year with Regents’ Chairman Paul Foster, Vice Chairmen Gene Powell and Steve Hicks, who comprised the search committee. “We are honored to announce Adm. McRaven as our sole finalist for the next chancellor of The University of Texas System,” Foster said. “Adm. McRaven is a nationally and internationally respected leader and a true American hero. His decades-long experience in proven strategic leadership, teamwork, vision, decision making, discipline, and working directly with national and world leaders make him an excellent choice — among a pool of extraordinarily distinguished candidates — to guide the UT System into its next chapter of greatness. 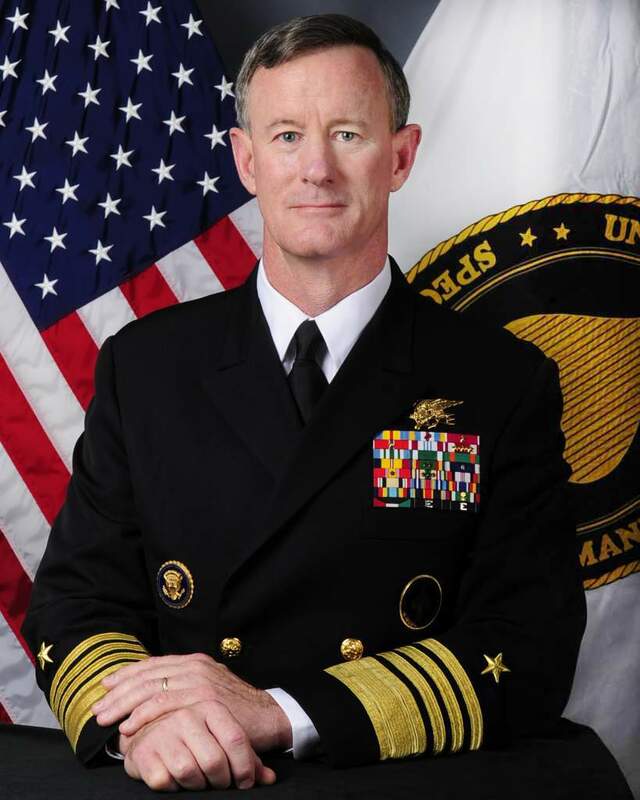 McRaven, a Navy SEAL, graduated from UT Austin’s College of Communication in 1997 and he earned his master’s degree from the Naval Postgraduate School. Throughout his 37-year-long career, he has served as commandant at every level within the special operations community. He was named Texan of the Year by the Dallas Morning News in 2011 and he was also honored by Time Magazine as a runner-up for Person of the Year. McRaven was nominated by President Barack Obama for his appointment to the rank of four-star admiral in 2011 and he was named commander of the United States Special Operations Command shortly after. In his position as the leader of U.S. Special Ops, McRaven oversees a 67,000-person, $10 billion operation and plays one of the nation’s most important roles in keeping the country safe. McRaven served as commander of Special Operations Command Europe and was the first director of the NATO Special Operation Forces Coordination Centre. He authored “Spec Ops: Case Studies in Special Operations Warfare: Theory and Practice,” which is considered a fundamental text on special operations strategy. McRaven planned and orchestrated the operation that led to the death of Osama Bin Laden, and he played a supporting role in the capture of Saddam Hussein in 2003. He has been described as bold, innovative, visionary and courageous both by national leaders and his military peers. In his world-spanning military career, he has served as a trusted White House advisor and spent countless hours delivering Congressional testimony, helping legislators understand critical policy issues. Not limiting his actions to strategy, warfare, and securing federal support, McRaven also led the creation of the Preservation of the Force & Family initiative, in the conviction that it was a “moral imperative” to provide for the mental, spiritual and physical well-being not only of those who serve in the Special Operations Forces, but also of their families. His wife, Georgeann, has dedicated most of her career to helping military families and wounded warriors. McRaven launched the development of the Tactical Assault Light Operator Suit or TALOS project. He challenged researchers and scientists to work together, in 2013, in order to develop a suit able to provide an exoskeleton made of liquid armor and smart fabrics to repel bullets, stop hemorrhaging and increase sensory capabilities. Several leading research universities, including Johns Hopkins, MIT and Georgia Tech, are collaborating with defense and industry leaders on this project. McRaven, whose father was an Air Force pilot and grandfather an Army doctor, grew up in San Antonio. He graduated from San Antonio’s Roosevelt High School and headed to UT Austin on an ROTC scholarship, where he majored in journalism. That was also where he met his wife. Selecting McRaven as the finalist for the chief administrative position at UT System is the result of a national search for a successor to Chancellor Francisco G. Cigarroa, M.D., who has served as the UT System chancellor since 2009, and who earlier this year announced he was to return to pediatric transplant surgery full time. Cigarroa will return to the UT Health Science Center at San Antonio, where he served as president for nine years, to head the pediatric transplant surgery department in January of next year. While he was serving as chancellor, Cigarroa continued to perform several transplant surgeries every month. Having maintained a strong focus on Texas health, he led UT System into establishing two new medical schools, one at UT Austin and another at UT Rio Grande Valley. State law sets the deadline for university governing boards to name finalists for chancellor 21 days before making an appointment. The Board of Regents holds another meeting in order to make an official appointment. McRaven’s new duties, if he is appointed, will begin in January 2015. The UT System is one of the largest public university systems in the United States, with nine academic universities, six health institutions and more than 213,000 students enrolled in 2013, and has been educating students, providing patient care, as well as conducting groundbreaking research for more than 130 years. The UT System confers more than one-third of the state’s undergraduate degrees, educates two-thirds of the state’s health care professionals annually and accounts for almost 70 percent of all research funds awarded to public universities in Texas. With about 90,000 employees, the UT System is one of the largest employers in the state.